Conversation starter products to address your invisible disability also can make it easier to live and work with the people you encounter in your daily life. The Invisible Disabilities Association (IDA) is very excited to announce the addition of two incredibly handy new awareness items in the IDA Store. Both products were inspired by people living with invisible disabilities and result in fulfilling many requests from our readers for ID cards, badges, and shirt pins. Therefore, as an organization working hard to see to the needs of all members, we are elated to bring these essential tools to our membership and the public. Foremost is the Invisible No More! Invisible Disabilities ID Badge Wallet, a hands-free lanyard with a pouch to hold identification and other cards. 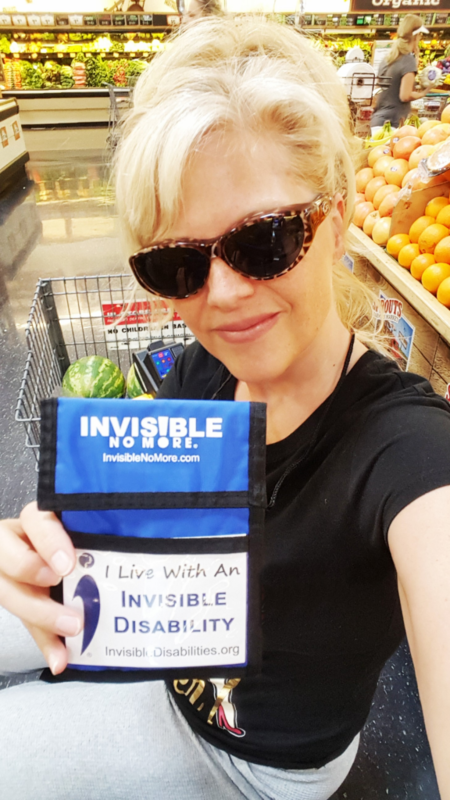 When you wear this to a doctor’s appointment, on the bus, to the grocery store or anywhere, you are also always prepared to share awareness about invisible disabilities and IDA. Disabilities ID Badge Wallet has lanyard and 50 invisible disability cards. Sherri, the wife of IDA’s founder, inspired this helpful item. Sherri lives with Progressive Multiple Sclerosis, Late Lyme Disease, traumatic brain injuries and toxic injuries. First-hand experiences and frustration often guide her to resourceful solutions. 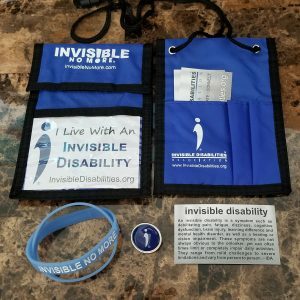 Sherri wanted a lanyard-type invisible disabilities badge holder with invisible disability information cards to distribute. Plus, she wanted this to be a hands-free option to carry essentials into stores and doctors’ offices. The design that resulted is ideally suited for that purpose with extra room to slide in health cards, insurance cards and more. No more juggling a separate wallet and purse along with other assistance equipment. The Invisible Disabilities ID Wallet comes with a badge saying, I Live with an invisible disability. You also receive 50 invisible disabilities cards and the roomy soft pouch for your license, cards, cash, and more. The second product is an Invisible Disabilities Lapel Pin. You can wear this to an appointment, to a meeting, to events or anywhere. Many thanks to Katie Maskey, who inspired this item. Katie lives with chronic pain, and she is an IDA Ambassador. 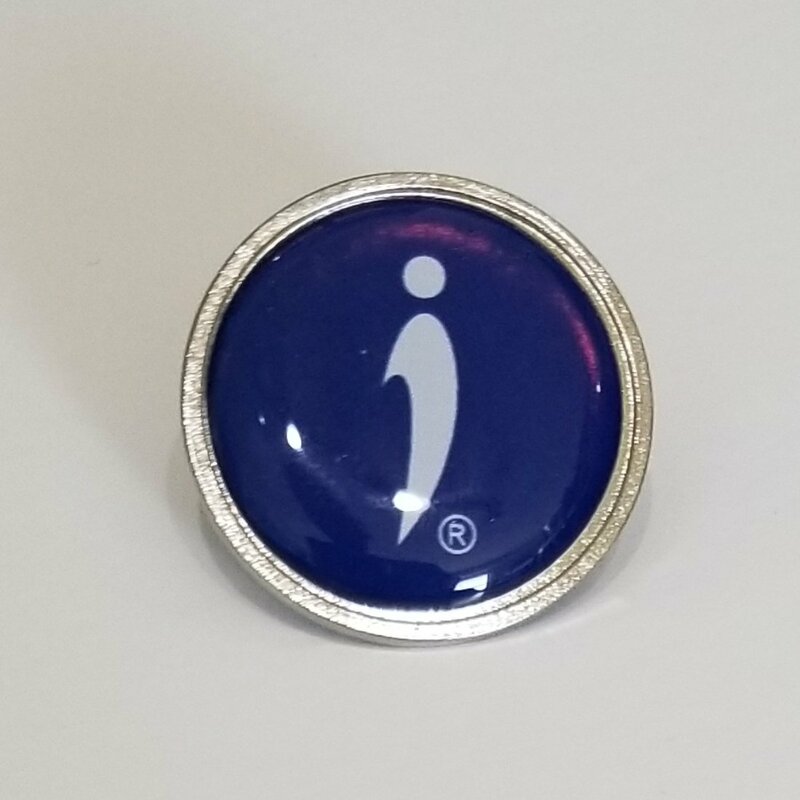 Katie wanted an attractive pin, displaying the IDA “I” logo that she could wear with a dress or jeans. This pin symbolizes challenges and triumphs. Therefore, it is an excellent conversation starter and aid to help you share with others about your invisible disability. Both of these new items are available in the IDA Store alongside the Invisible No More! glow-in-the-dark wristbands, “But You LOOK Good!” books and pamphlets. For a short time, we are running a special offer on the Invisible Disabilities Badge ID Bundle with the ID Badge Wallet now through Invisible Disabilities Week, October 15-21. During Invisible Disabilities Week, we will be “Boasting Our Blue” as visible proof that we are “Invisible No More!” Participants can post a photo or video wearing their Invisible Disabilities ID Badge Wallet, Invisible Disabilities Lapel Pin, Invisible No More! Wristband, IDA Shirt or wear their favorite blue shirt, hat or scarf. Our online presence and voice during IDW create many noteworthy opportunities each year to deliver on our mission. Take your photos or videos alone or with your favorite person, in your chosen place or with your beloved pet. Tell us why you think invisible disabilities awareness is necessary or how you want to be Invisible No More!®We look forward to hearing from you! Finally, always remember the Invisible Disabilities Week Online is FREE! No purchase is necessary. All activities are optional and therefore your participation is important. Donations and proceeds from products during IDW help fund our outreach of awareness, education, and support around the world. Together we can make a difference in the world and your community! Thank you! 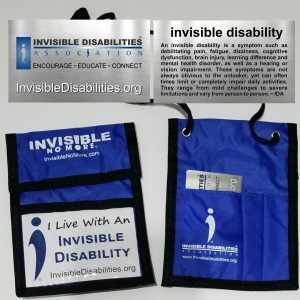 Conversation starter products like this Invisible Disabilities ID badge wallet address your invisible disability. They make it much easier to live and work with the people you encounter in your daily life.